In February 2004 I was studying in Korea with my Korean wife, whom I met here, and our two sons. For the last few months I had struggled from intermittent lower back pain. I felt the muscles tightly wound up into a ball on both sides of my lower spine, but since I was finishing up my Ph.D, dismissed it as muscle tension. One Saturday I was at my lab preparing for some experiments on Monday. As I worked at the deep freezer preparing samples, my young son, Jarrod, two-and-a-half years old, watched and played nearby. I was hunched over for only about two minutes, but as I tried to straighten up, my back exploded with pain and I suddenly felt nauseated. I tried to ease up and stretched, but this made it even worse. In a cold sweat and shaking from pain, I sat on the window ledge, still hunched over. It was lunchtime, and no one else was around to help. However, Jarrod immediately realized something was wrong and started asking me in Korean, ‘Daddy, are you okay? Are you hurt?’ I stood up as best as I could, locked the freezer and painfully shuffled to my laboratory. There I held on to a metal shelf full of glassware, trying to clear the nausea. Jarrod stayed by my side asking if I was all right, over and over. I could feel my mind slip as I tried to hold a thought, then heard glass rattle and realized I had fainted, hitting the shelf as I fell. Jarrod was still next to me, now almost in tears but staying strong on his own initiative, asking in his gentle voice, ‘Daddy, are you OK?’. Fainting had eased the back pain but not the nausea. I was able to stand, walk to my office and sit down, horrendously nauseated. Jarrod stood there begging me with his eyes to say that this was a joke and all was really fine, but I couldn’t. I asked him to leave me alone for a moment. One of them stayed with me and the other went to get my wife. 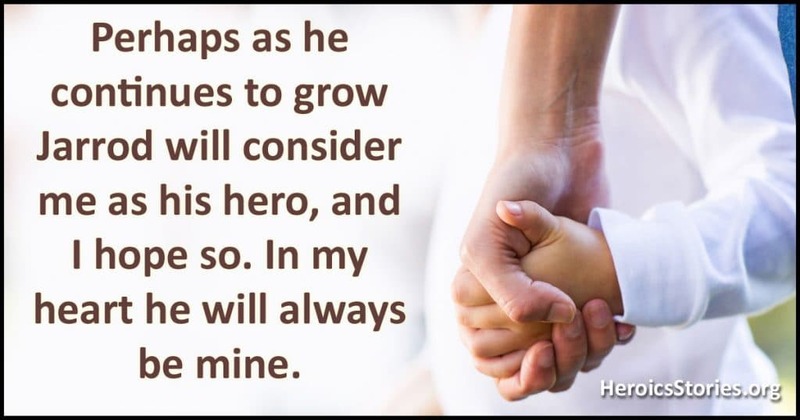 But Jarrod was still there, standing as strong and tall as a two-year-old could, watching and protecting me with a will surpassing that of children his age, and doing the job I thought belonged to a parent, not a toddler. Many parents believe their children are extraordinary; I certainly do. Perhaps as he continues to grow Jarrod will consider me as his hero, and I hope so. In my heart he will always be mine.